Because people are living longer and lead more stressful lives, teeth are being exposed to many years of crack inducing habits such as clenching, grinding, and chewing hard things. These habits make teeth more susceptible to cracks. Typically teeth with cracks/fractures are undetectable on radiographs (x-rays). Hence, cracked and fractured teeth can especially be difficult to locate. When the outer hard tissues of a tooth are fractured or cracked, chewing can cause movement of the pieces, and the pulp becomes irritated. Often this results in a momentary, sharp pain which eventually progresses to include thermal sensitivity. In time the cracked or fractured tooth, similar to other teeth with pulp degeneration, can begin to hurt on its own. How do I know if my tooth is Cracked or Fractured? Does your tooth feel like it “zaps” you when bite on it? Cracked or fractured teeth exhibit a variety of symptoms. If your tooth is cracked/fractured, you might feel occasional pain when chewing, particularly between bites as you release the pressure on your teeth. You might also feel pain when you eat or drink something hot or cold. In many cases, the pain may come and go, and the dentist may have difficulty locating which tooth is causing the discomfort. Don’t all Cracked/Fractured teeth hurt? Not all cracked and fractured teeth hurt. It really depends on the severity of the crack and the pulps’ response. 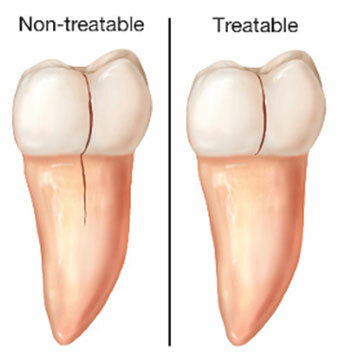 A crack/fracture can make the tooth sensitive due to movement of the fractured tooth pieces and/or leaking irritants into the pulp and even allow bacteria to come right in causing eventual infection of the tooth. Inside the tooth, under the white enamel is a hard layer called the dentin, and there is the soft inner tissue called the pulp. The pulp contains blood vessels, nerves, and connective tissue. The pulp is a vestige of what originally formed your tooth when you were a child. Chewing can cause movement of this crack in the enamel and/or dentin. The pulp can become irritated by the movement of the crack. When biting pressure is released, the crack can close quickly, resulting in a momentary, sharp pain. Eventually, the pulp will become damaged to the point that it can no longer heal itself. The tooth will not only hurt when chewing but may also become sensitive to temperature change. In time, a cracked tooth may begin to hurt all by itself. Extensive cracks can lead to infection of the pulp tissue, which can spread to the bone and gum tissue surrounding the tooth. Does my Cracked or Fractured tooth need to be Treated? That depends on if the crack/fracture is caught early enough, often times only a restoration that holds the tooth together will be needed. Once the pulp begins to degenerate and/or becomes infected, it must be treated endodontically if the tooth is going to be maintained. Like cracks in a windshield, cracks in teeth can often remain small or progress slowly over time. I believe that the sooner a crack or fracture is detected and appropriate treatment delivered, the better the chance of maintaining your tooth. How will my cracked/fractured tooth be treated? The treatment of your cracked tooth depends on the type, location, and severity of the crack. Cuspal Fracture: When a cusp or the pointed part of the chewing surface of your tooth becomes weakened, the cusp will fracture. Part of the cusp may break off or may need to be removed by your dentist. Depending upon the extent of the fracture, the pulp may also become damaged. Endodontic therapy is needed when the pulp is damaged beyond repair, and a crown will be placed to help protect the tooth and replace the fractured tooth structure. Cracked Tooth: This type of crack extends from the chewing surface of the tooth vertically towards the root and sometimes below the gum line. A cracked tooth is not completely split into two distinct movable segments. If caught early enough, the tooth is usually crowned, but endodontic therapy may be needed at a later date (typically in the first 6 months). Nonsurgical endodontic therapy (root canal) will be needed when the pulp becomes substantially injured or exposed. During endodontic therapy, the inside crown portion of the tooth is stained with a temporary dye and viewed microscopically for the extent of the fracture. Prognosis depends on the severity of the crack. A full crown is needed to hold the tooth together. Split Tooth: A split tooth is a cracked tooth in which the crack has progressed so there are 2 distinct segments that can be separated from one another. Unfortunately, with today’s technology, a split tooth can never be saved intact. The extent and position of the crack will determine if any portion can be maintained but most of these teeth will be extracted. In rare instances, endodontic treatment, possibly some gum surgery, and a crown may be used to retain a portion of the tooth. Unlike a broken bone, the fracture in a cracked tooth does not heal. In fact, even after treatment, it is possible that a crack may continue to worsen and separate, resulting in the loss of the tooth. How long will a cracked or fractured tooth last? Unfortunately, there is not a definitive answer. The prognosis is related to the extent of the crack/fracture. Prognosis becomes poor when the crack extends below the gum line. The problem is “like a crack in a windshield; it can stay the same or spread”. It is difficult to predict how long a fractured/cracked tooth will be maintained in your mouth. Wear a mouthguard or a mask when playing contact sports. If you experience symptoms of a fractured or cracked tooth, see your dentist immediately. If detected early enough, a cracked/fractured tooth can often be more likely to be maintained. All of the common cracks and fractures of the crown region start on the surface and work their way into the tooth toward the end of the root.